I’ve never understood why they call it a fork in the road. What they really need are barbecue tongs, which signify coming to a spot where there are two options as far as a road to travel. Hey Lakers, you’ve reached a…barbecue tongs…in the road. On one hand, it’s understandable. How does a team say no to LeBron James? On the other hand, the Lakers are getting what they deserve. For half a decade, they’ve shamelessly begged every star, any star, to come wear the purple and gold (and sometimes black). When you cast that wide of a net with no specific plan or intention, you get what you get. This has led to a very clear and present danger. The Lakers must make the right choice. They must go young, or go old, not both. The problem is, I’m not sure the Lakers are even aware that a choice needs to be made. LeBron and his band of not-so-merry young men got along about as well as Donald and Hillary this year. It’s difficult to see that getting any better anytime soon. The King is clearly in a twilight zone, as in the twilight of his career. Injury issues are becoming a thing for the first time and his ultra-competitive desire to win now feels more like a semi-casual yearning to make the playoffs. He openly speaks about already being the greatest of all-time. If that’s how he feels, what’s left to prove? The Lakers have to decide if they want to continue to travel this nostalgic road with an all-time great or allow a young core to grow into an NBA contender on its own. 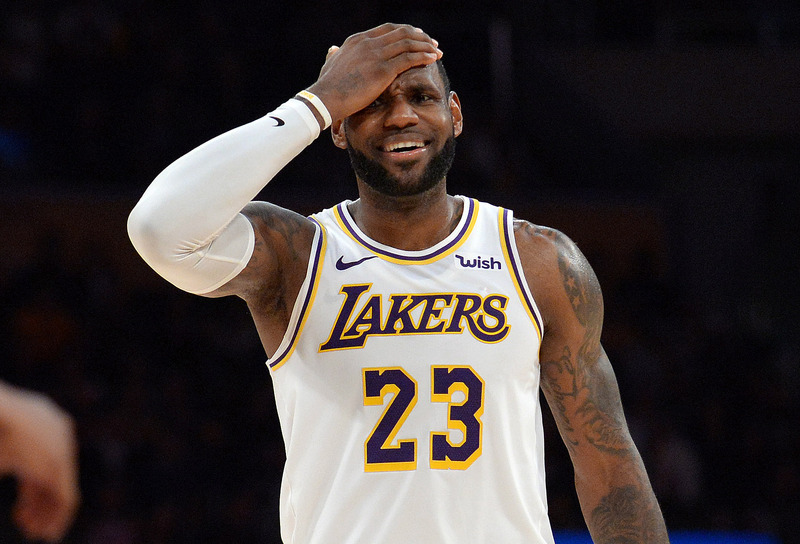 LeBron’s presence, combined with his desire to force the Lakers into his whimsical transactions, is totally stunting the growth chart of the team. Lonzo Ball had another on and off year filled with injuries, and now is dealing with the always inevitable split with Big Baller Brand. Brandon Ingram had another year of flashes of future stardom mixed with moments of inconsistency and eventual injury. Kyle Kuzma was good again, but we still can’t quite put our finger on what his ceiling is in the league. Who are these guys? We may never know if LeBron continues to lay his heavy blanket over the organization. The team seems poised to let James make a coaching change in the coming weeks as well. With all that said, it’s not an easy call. If you flip the team over to the youth academy, there’s no guarantee the whipper snappers are going to ever compete at a high level in the stacked west. Ingram and Kuzma are really good, but they’ll need to be great. No one is sure they have that in them. Ball is a nice piece at a minimum, but has a long way to go to prove he is a vital piece. And if the Lakers choose youth over stardom, they run the biggest risk of all. They could fall back into the post Magic or post Kobe doldrums best described by the word…boring. That word hurts inside the Laker hallways. It’s their biggest fear. The city of Los Angeles has no time or energy for boring. And the Lakers, through their titles and titillation, always promise their fans they won’t do boring. What usually wins in the NBA is a core of players who grow together through some leaner years, then acquire some complementary free agents, and thrive. This describes the Warriors, a team that watched Steph Curry and Klay Thompson go through a lengthy process of becoming great. The Sixers are trying to be the next, as are the Bucks. However, LeBron, as he always is, is an exception. He has shown that he can go to a city, sit down with a pen and a bucket of cash, and lead a team to championships. This brings us to the month on the calendar that really seems to matter in today’s NBA: July. The concept of joining LeBron to build a super team is a road well-traveled, but it’s a fair question to ask if that road has come to a dead end. Each of the following players is potentially available through free agency in a few months: Kevin Durant, Kawhi Leonard, Kyrie Irving, Klay Thompson, Kemba Walker, Tobias Harris and probably Jimmy Butler. The specter of an Anthony Davis trade exists as well. The idea that at least one of them wouldn’t be foaming at the mouth to join LeBron seemed ridiculous a few months ago. Now, any pairing seems challenging. There are truly three options for the Lakers, but we chose barbecue tongs because one of the options has been eliminated. The Lakers CANNOT just do the same thing again. They can’t strike out in free agency and return in October with an almost 35 year-old LeBron dismissing the importance of Ingram and Kuzma and empowering the likes of Lance Stephenson. That leaves the following choices. The Lakers can go all in on LeBron. They’ll need to find another star that fits and wants the role. They’ll need to find a coach who can be more than just a James puppet. And then they’ll need to get it together fast, because the west will still have other good teams and LeBron’s age clock is ticking. The other choice is the unthinkable. Trade LeBron James. They can combine their young core with whatever they get in return and continue the west coast version of the process. They can also keep praying that Durant leaves for the Knicks, which would seem to open the west up. Neither option is perfect, but that’s hardly a surprise as the Lakers’ work in building this mess was pretty flawed as well. The suggestion: Make some calls, be open to anything. As odd as the Lakers fan base can be, most of them would actually applaud flipping LeBron for something productive and continuing to watch their homegrown talent. The prediction: The Lakers will choose LeBron. Luke Walton will be relieved of his duties, one or more of the young core will be traded, and the Lakers will continue to be both dramatic and ringless over the next three years.